After all of that M. Night/"The Happening" hullabaloo, I (naturally) went to the video store to pick up some of his older creations. "The Sixth Sense" was checked out (go figure). I've seen "The Village" so many times that I'm beginning to understand what those derelicts were thinking (problematic). "Unbreakable" features on TBS at least 28 days a month (plus, Samuel L. Jackson is annoying me)...and, alert me if I'm wrong, but "The Lady in the Water" just has too much Bryce going on (you know what I mean). That left "Signs," and when I watched it today, surround sound in full swing, all alone in el basemento, I remembered what it was that made me love M. Night in the first place. "Signs" is a thousand times better than "The Sixth Sense." It baffles me that the latter made it to #89 in the AFI's Top 100 in 100 last year. Not that I trust their taste implicitly (GET OVER CITIZEN KANE), but come on. "The Sixth Sense" is a quiet, well-acted, expertly-directed ghost drama. I like it, but I've never had the impulse to watch it twice in a row. Like I did today. With "Signs." As soon as the crop circle movie was over, I had this feeling like I wanted to watch it again...and again...and again. This is the movie we should watch when we want to see what kind of a director M. Night really is. He is a quiet directer. He is, contrary to popular belief, unadorned, sans glitz, and he tells stories with his camera much like Kevin Brockmeier tells stories with his prose: never at length, from familiar perspectives, glancing from space to space, covering all angles, and surprising us, not so much with terror or the slicing of a violin, but with little pieces of the human soul, pieces that distill and disappear like snowflakes on the sleeve of your sweater. 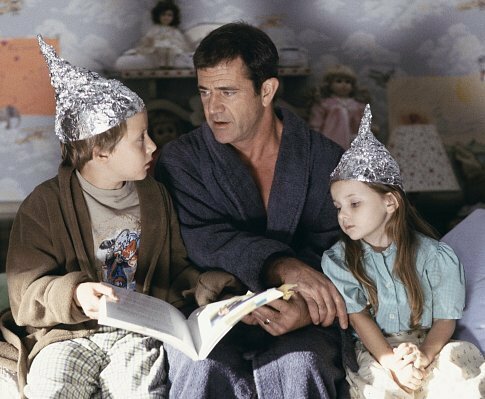 My favorite part about "Signs" is Mel Gibson. I know he's got a bad wrap and everything, but this was pre-crazy-Mel-with-the-beard, and I like him in this movie. He makes it for me, a product of perfect casting. The character of Graham Hess comes with many dimensions. He is a man who's been stripped of his wife, his faith, and now his home has been commandeered by what some are calling the end of the world. His brother Merrill (Joaqui n Phoenix) is around to help with the kids, living in a room over the garage. The kids, Morgan (Rory Culkin) and Bo (Abigail Breslin) are growing wary of the life their father leads, and they notice his lightless eyes better than anyone. Graham knows it, too, but he's not willing to come clean. He somehow feels responsible for his wife's death, not because he is, but because he once believed in a god that let it happen in the first place. He cannot forgive God. He lives every day trying to get past it. He does not want to be called 'father' anymore, but the members of the town seem so reluctant to call him anything else, that we can only infer what he means to them all. It's a very sad story, and the wrinkles in Mel's face as he looks past the signs, the curtains that lift and close behind his eyes, revealing only portions at a time--they all really work. Looking back on it all, it would have been nice to see "Signs" get any kind of Oscar recognition. Perhaps a nod for Mel. He did such a fantastic job bringing this small film to life. And that's another thing: small films. Many people seem to be under the delusion that M. Night Shyamalan is trying to make blockbusters, and maybe it's because of the poor choices that have been made concerning opening dates, but none of it's true. M. Night Shyamalan's movies are rarely of blockbuster caliber. None of them are big or booming or special effecty at all. His films are about careful scene work. They're about people talking and not talking during periods of crisis. He has a knack for directing news media clips and for writing the stories of strained relationships. In "Signs," the strained relationship lies in the heart of the Hess household. Something bad has happened. It shook the foundation, and the family must deal with it somehow. Morg an is the older brother, played with commanding, Culkin sway by little Rory. He is curious, not defiant, but steadfast, always ready to stand up for himself, his sister, and the way things used to be. Bo is the little sister. She is played by a very young, pre-"Little Miss" Breslin whose giant eyes shine like orbs. Bo is intuitive, sometimes omniscient. She always seems to see what the others do not. Her water obsession says something about the unusual way she views the world. And then there's Merrill. I like it when Joaquin Phoenix does vulne rable, because he does it well, and even though Merrill seems strong and hard and weathered well, he is still, compared to his older brother, a very young man. He carries a fierce love for Bo and Morgan--and for Graham, whom he sees as a sort of fallen idol, the man he's always wanted to be, now mangled and tossed on the shore. He spends most of the movie taking control, while his brother stands idly by in his pain. By the end, however, Merrill realizes that he, too, can conjure faith, even if from a man that has cast all belief to the horizon. "Signs" is a powerful work in characters. The film itself, as a piece of art, contains strong camera work and a vast intuition on M. Night's part toward the subject of emptiness. How can a family, so bereft, come together in a time of human catastrophe? For a time, they're drawn apart, separated by things that would otherwise seem inane. But the thing I love most about M. Night's films is the harmony created in the end of them all. Even when they start with separation and loss, pain and the crucial uncertain--they always end on a shimmer of hope. And this is something we can all understand. That was very thorough, well written. I write a wee bit here and there, but currently as a stay at home dad, I can only manage ideas on scraps and filing them in my sock drawer next to hardware store coupons in a Ziploc bags. I am a bit of fan of M. Night myself. I agree that Sixth Sense is misplaced along with other movies on the AFI 100. That is definitely another story. Signs is a family favorite amongst my parents and younger brother, and should be on the list. I have put on the Village and Signs at times just for background music and to sir and watch a bit just to chill out. I have joked my dad before because he leaves several half drunken glasses of water throughout their house, calling him Bo. Again I agree that the casting is well done, eh, perfect and is very important to any movie. I actually found this article because I wasn't exactly sure on the wording of the,calm down fruit comment wording, as me and my brothers text each other randomly lines from movies. Thanks for your time !